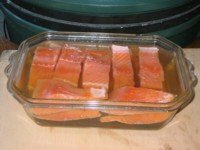 From the most basic of smoked salmon brine recipes (my first recipe) comes a second recipe that has a few significant additives that will really enhance the flavor of your hot smoked salmon. So it's not rocket science, just some seasonings to bring the brine to life. The salt is in there to help remove some of the water and also to aid the movement of the sugar that will act as a tenderizer. There's very little to this recipe in terms of the ingredients, the main challenge is to ensure that you brine your salmon for the right length of time. It's a strong brine so getting the timing right can make a big difference in terms of how salty the final results are, of course the degree of saltiness is down to individual taste so this is one of those recipes where you monitor the amount of time that the fish is in the brine (and the thickness of the fish fillet), taste the results and then gradually vary to your taste. At the bottom of the page I've also included some approximate timings for how long you need to brine your salmon before drying and smoking. Remember, this is just a guide and your own taste may be different to mine so you might not get it right first time. To ensure that you continue to get better and better at brining, keep a pencil and paper handy so that you can note the brine strength, the weight of the fish and the time that you brine it for. That way you can learn by your mistakes and finally find the perfect flavor for you. Before the additions, let me just remind you of the basic brine recipe. Measures are in both metric and imperial units. There are no allergens in this salmon brine recipe. Once mixed, put this brine aside to chill. Once the brine is chilled, you can immerse your salmon in the brine (timings below). Use an electronic timer with an alarm to monitor your brining time. To brine a good quantity of salmon is going to cost you a lot of money and the last thing that you need is to forget about it and end up with a salty offering. Make sure that your salmon is fully immersed. The salinity will change after the salmon has been immersed so you cannot guarantee the concentration (and therefore brine timing) for a future batch. It's not really a second recipe, just a few more flavourings added to the basic brine mix. Measure the seasonings into a small saucepan and add a small amount of your mixed brine so that you can make a paste. Bring it to the boil and then allow to cool before chilling and then adding to your already chilled brine mixture. All that remains now is to dry and smoke your fish. Dry it by placing it on a cake cooling rack in your refrigerator overnight. To smoke your salmon it's a two step process. 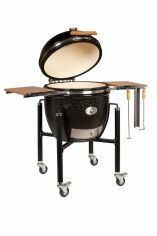 Step 1 is to gradually bring your smoker temperature up to 80°C or 175°F over a period of about 30 minutes and then step 2 is to further smoke the salmon for another 30 minutes.